Get a Humixx tripod selfie stick, get the beauty world! 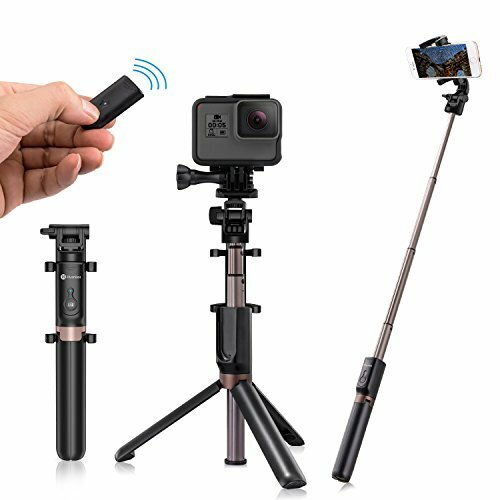 [1/4" Screw Port for Action Cameras]: This tripod selfie stick combines smartphone holder and 1/4" screw port for action cameras. Get better pictures&videos for traveling, family gathering, night out, hiking, holidays, graduation, party, live broadcasting etc. [Better Protection for Phone]: We adopt the premium materials, it finished with anodic oxidation process, more durable when take pictures. The phone clamp and the stand attached silicone pad to take more care for your phone. [360 Degree Rotation Phone Holder]: Unique design with 360 degree rotation, 210 degree flip, help you to find better angles. The central stand is adjustable to keep more steady, get better angles with safety. [Wireless Controlled]: Built-in removable wireless remote controller. The sensor range is within 10m. Good partner to take photos or videos, especially for party and for travel, good idea to take all people in. Also a good gift for whom like to take pictures and videos. [No Worries & Premium Service]: All products sold by HUMIXX-US have been 100% QC tested, we promise the 30-day money back and 180-day free replacement. If there is any quality issues, please don't worry, we will provide 24h*7d timely customer service to solve the problem better. If you have any questions about this product by Humixx, contact us by completing and submitting the form below. If you are looking for a specif part number, please include it with your message.